Are you new to Kayako and don’t know where to start? Do you think you are not using Kayako help desk to its full potential? Our training and consultancy programs can help you solve these questions, reduce implementation times, reduce the learning curve and get the most out of this tool. Our programs are offered online or on-site, you decide what works the best for you. Our consultants and trainers have more than 6 years of experience in Kayako projects around the world. 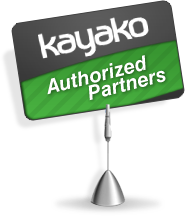 Our company is the first, and so far, the only Kayako authorized partner. We create custom training programs based on your needs, number of people, availability, location and time restrictions. The duration and agenda depends on your needs. Need a quick online session for one person? then an online training will be just right for you. Neeed to train an army of staff agents? on-site will work best for you.